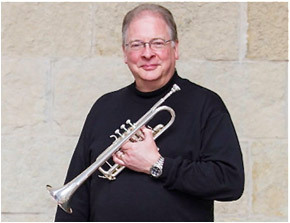 John Aley is the professor of trumpet at the University of Wisconsin-Madison School of Music. He is a former member of the American Brass Quintet, with whom he performed extensively throughout the U. S. and internationally. He has performed with New York based ensembles such as Musica Sacra, American Symphony Orchestra, Orpheus Chamber Ensemble and American Composers’ Orchestra. He has recorded with the American Brass Quintet, the PDQ Bach Orchestra, the Orpheus Chamber Ensemble, the American Composers’ Orchestra, the Wisconsin Brass Quintet and numerous other ensembles. Aley has performed as soloist with the English Chamber Orchestra, the Composers’ Brass Group, and on various public radio broadcasts throughout the U.S. He has performed as principal trumpet and soloist with the Wichita Symphony, and the Greenwich and Stamford symphony orchestras. He has been a soloist with the Vienna Chamber Orchestra in concert with Maurice Andre. He is principal trumpet with the Madison Symphony Orchestra and has been featured as a soloist on numerous occasions. He has performed in orchestras under the baton of legendary musicians Leonard Bernstein and Aaron Copland. During the summer he is an artist/teacher at the Interlochen Arts Camp, Michigan. Aley has also taught and performed at the Aspen Music Festival, the Yale Summer School of Music, UW-Madison Summer Music Clinic, the New England Music Camp, Minnesota Festival of the Lakes and the Hot Springs Music Festival. He has been a featured performer, clinician and adjudicator for the International Trumpet Guild. Prior to his appointment at the UW-Madison School of Music, John Aley taught at Brooklyn College of Music, Wichita State University, and Western Connecticut State College.